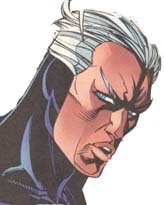 Truthfully, it's a little complicated to roleplay Pietro. He, overall, is the fastest man alive (bah to the Flash!) and yet is forced to live on a world of slowness. Everything he sees moves ultra slow, and everything he hears is as if someone was playing a tape recorder on slow motion. Try and imagine living a life like that, now you know why Pietro is so unpatient and arrogant. 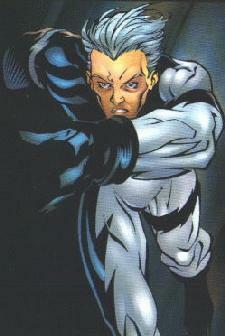 To me, Pietro is a very intresting character, though. To be the fastest man alive would be awesome! Think of the things you can do! Run across water several feet before sinking, run so fast it's impossible for someone normal (and even abnormal) to see you, and even create whirlwind with your amazing speed. It's a dream come true, and here on Marvel-X, is my chance to have it. Pietro's family is also very intresting. He's the son of Magneto, the killer of humanity. Now how intresting is that?! The son of Magneto, come on! He's the brother of the Scarlet Witch, Wanda Maximoff. Being the brother of someone who can make magnetic fields turn into batches of flowers is just neat. He's the husband of an Inhuman, Crystal. This incredibly beautiful Inhuman makes Storm look weak. And he's the father of Luna, an exact look alike of Crystal. Being a father has always been an experince I'd like to learn about. Again, Pietro is a great chance. 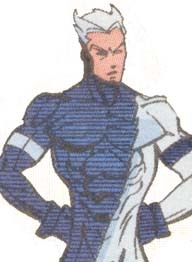 Overall, I think it's Pietro's life that intrests me. His whole life he has been running from his life, from the first time his adoptive father stole food from a village, resulting on him getting caught and him running out, saving his sister from the attacking, to the time Wanda lost control of her Hex powers and set their home ablaze, causing people to attack them because she was thought a witch, to the point of a curse he's forever stuck with, him being to son of the killer of humanity, Magneto. All these things are intresting, making Pietro a very neat and detailed character, one of the bests in my opinion. With such detailed abilities, and a very good background, Pietro indeed is a very fun character to roleplay, and I was very lucky that no one had him at the time.